Hi everyone!! I hope you are having an awesome Friday!!!! As for me, well so far so good. The weather is changing and to be honest with you, I was getting tired of the heat!! I know I will complain about the cold weather by the end of November! LOL. 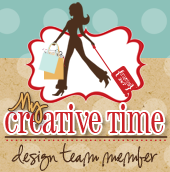 Anyways, I was so excited when I found out Emma at My Creative Time was having a design team call. I have been a big fan of Emma for a while and had the pleasure of meeting her last March at our local expo. She actually lives really close to me! Anyways, I have a few of her stamps and dies that I could defiantly incorporate in my layouts and projects. I hope she gets a chance to look at my other layouts and projects. Enjoy! I used some brown cardstock for the main background and covered it with dollie leaves I found at the dollar store. This is the banner I made using Emma's Build a Banner Kit. I made a burlap flower using Tim Holtz flower die. Here's a picture of me and Emma.. Have a wonderful weekend! Beautiful lo! Love the little banner! Excellent job! What a gorgeous layout! And how lucky are you!? Emma is the best! :) Great job! Very cute LO. I really like the colors you used. I don't think I would have thought put them together. Turned out really pretty! Good luck on the DT call! Roberts Arts and Crafts DT project.